Tonkatsu is breaded (deep-fried) pork. This restaurant was extra special because they offered seconds in rice, cabbage and miso soup, not bad for 1500 yen. 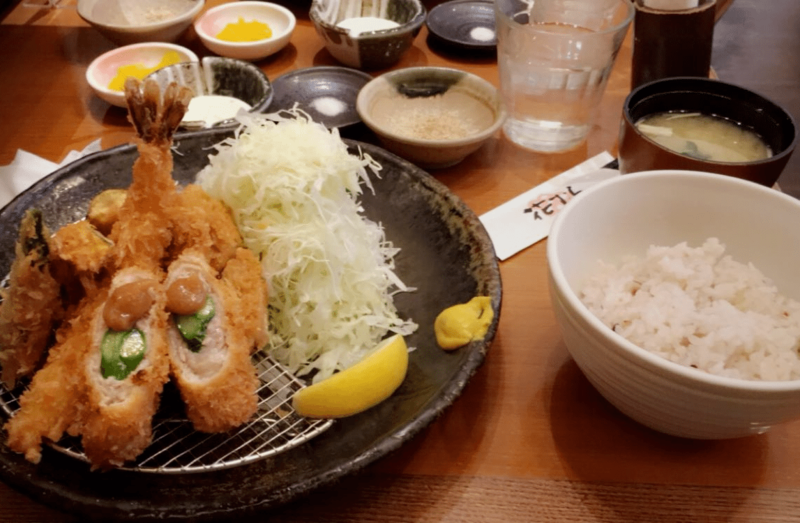 This particular set offers not only tonkatsu, but a variety of other breaded goodness as well, such as shrimp, eggplant, shishito (Japanese green pepper) and pork loin wrapped around asparagus with a house-made special sauce on top. There is no proper way on how to eat tonkatsu, it is to your liking. This restaurant recommended combining salt, sesame seed and tonkatsu sauce. Okonomiyaki is a Japanese pancake made from flour and a variety of other ingredients. “Okonomi” meaning “what is your preference?” and “yaki” meaning grill allows for this dish to be made with the ingredients of your choice. On the left is made with bacon, avocado, tomato and Gouda cheese. 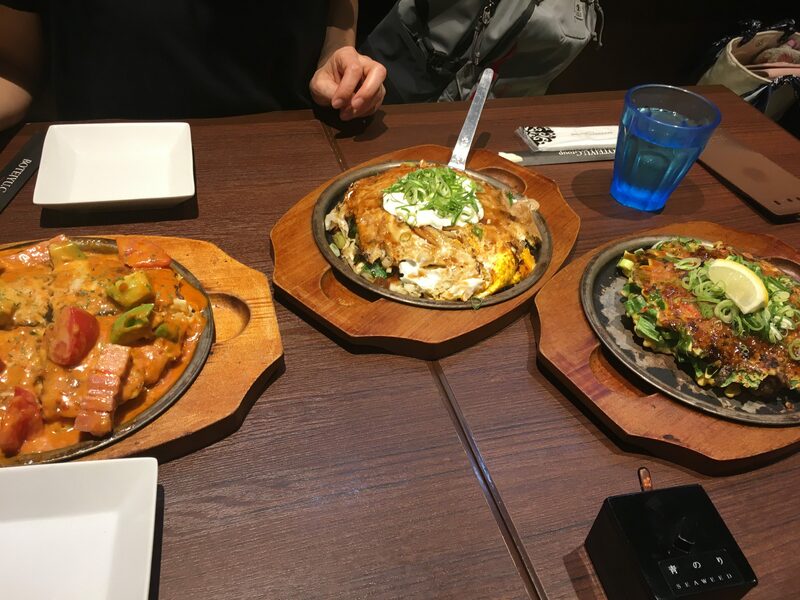 In the middle is a “modern” okonomiyaki. Modern because it sandwiches “yakisoba” which is grilled noodles and combined with pork, beef, cabbage, egg, mayo and green onions. On the right is made with extra with green onions and a hint of lime. Similar to tonkatsu, there is no proper way to eat okonomiyaki. However, it is commonly eaten with okonomiyaki sauce, shichimi (chilli peppers), bonito (fish flakes) and nori (seaweed). Kaiseki Ryori is a traditional Japanese style multi-course meal, comparable to a tasting menu in North America. It consists of multiple different Japanese dishes made from seasonal ingredients and sometimes includes a chef’s speciality. Kaiseki Ryori changes throughout the year as not all ingredients are always available, meaning chefs have to constantly create new recipes from scratch, truly a form of art. Train is the most common and effective method of transportation in Japan and it is most used by working class people. So why not try to simplify eating for those individuals who always have to be on-the-go? On the Japan school trip we aimed to eat like the locals. In comes the “ekiben”, which is a fully disposable bento box. 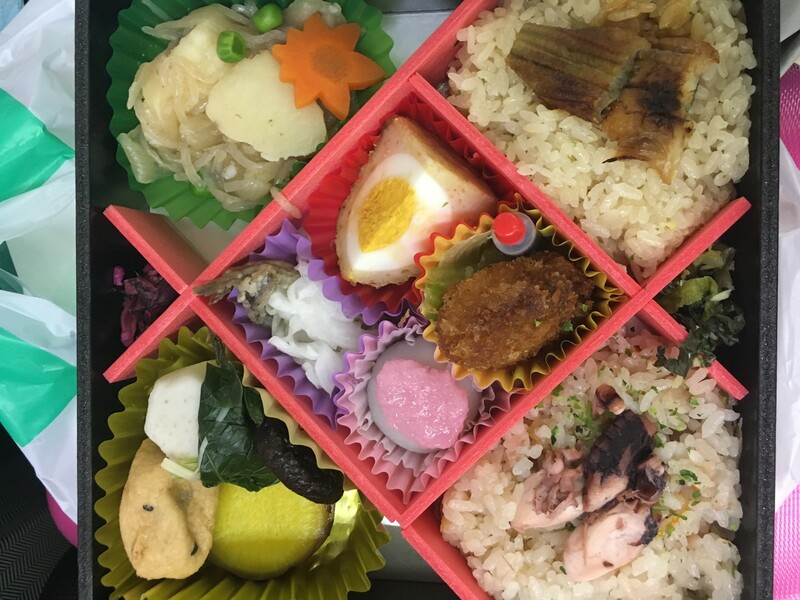 Ekiben can be purchased at any train station throughout the country and comes in all shapes and sizes with a multitude of different items. Happy eating! Next on our Japan school trip: Miyajima. If you’re a fan of oysters, Miyajima will not disappoint. This coastal island is home to the most flavourful, tasteful and satisfying oysters in the world. What makes it even more appetizing is how these oysters are served. Tonight’s dinner consisted of oyster curry, salad, pickled vegetables, potato wedges, breaded oysters and rice, delicious. It’s a common misconception in North America that Japanese dining consists mainly of dynamite rolls, avocado rolls, tempura and chicken teriyaki. So you may expect similar dishes when dining in Japan, however, these are dishes made to cater the North American tongue. 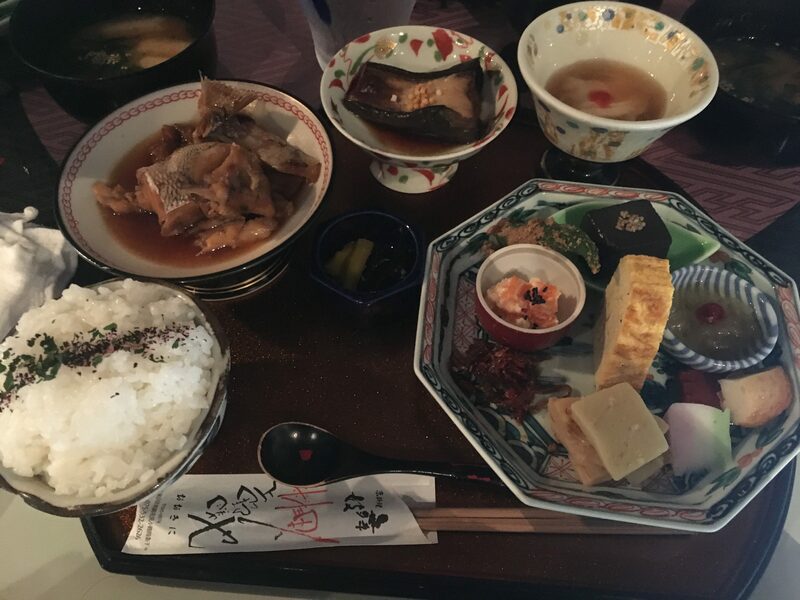 As you can see, authentic Japanese cuisine goes far beyond that, so stop daydreaming about your next stop at an “all you can eat buffet” and try something new!